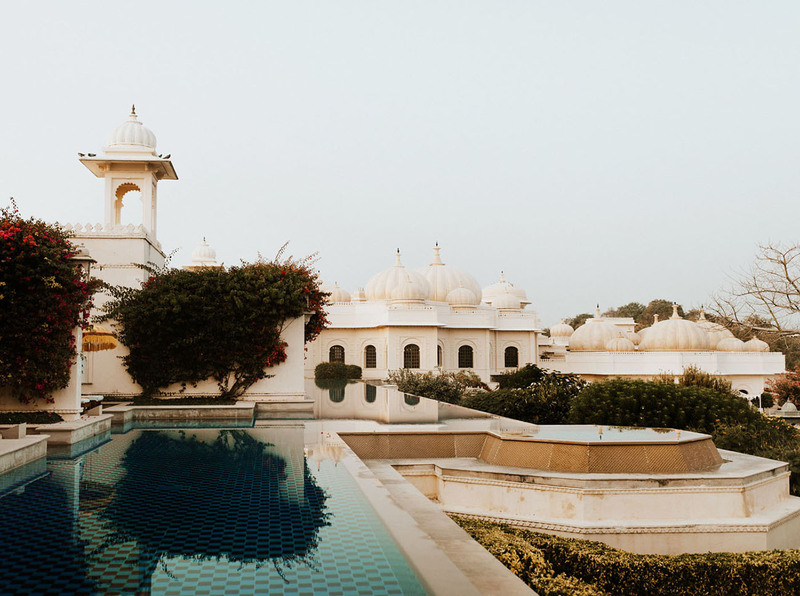 When you’re traveling through India with your fiancé and you happen to be staying at an actual palace hotel, you take advantage! 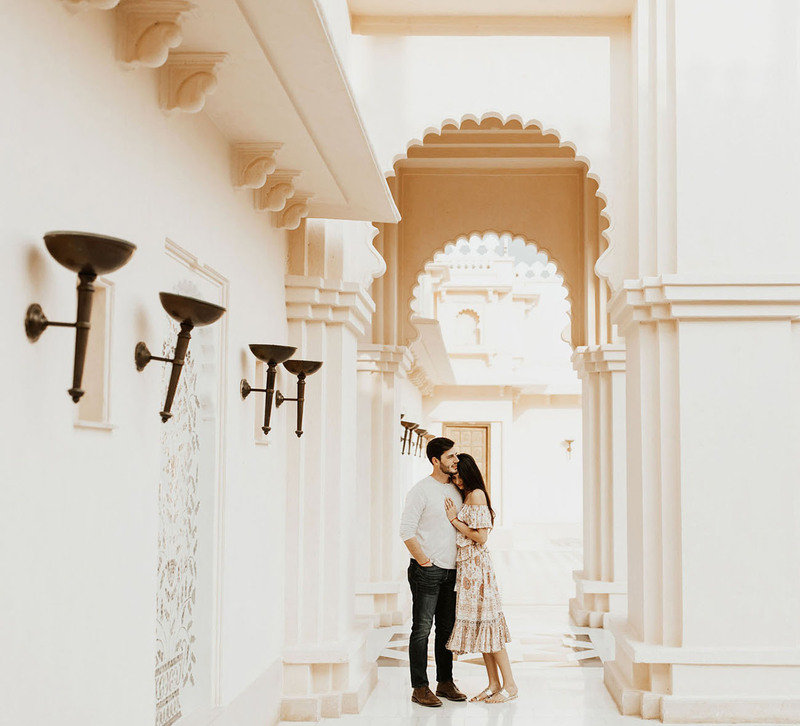 Sydney + Dexter called up the talented Anni Graham to capture their engagement photos around the stunning property of The Leela Palace Udaipur. 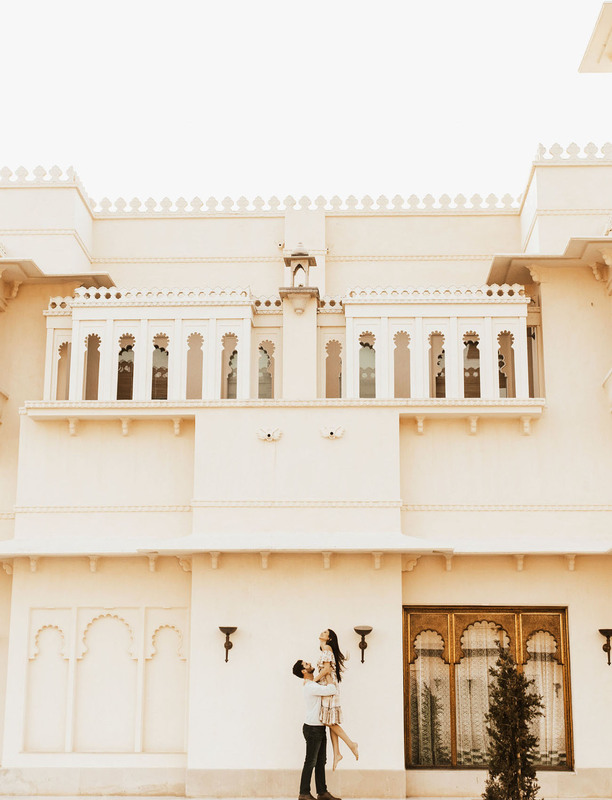 Having grown up in India most of her life, Anni was thrilled to share her experience in such a significant place with S + D! Here’s the totally meant-to-be story of how they met from Dexter’s perspective, accompanied by beautiful photos by Anni Graham! Sydney and I matched on Tinder in 2014 when it was more of a game than a dating app. I can still remember the first photo I saw of her. She had her arm around her mom and had the most genuine smile, gazing into the camera as if to show the world all the love in her heart for her family. I wanted that. I was immediately awestruck, running to my roommate and brother to brag about this angel I matched with. I agonized over her profile for days waiting for a response and after a few arm-twisting messages through the app, she gave me her number. I did my best to play it cool but failed miserably. Something about this girl was different. To wait 15-30 minutes to text her back, to me, was madness. If there was “a game” she was winning and I didn’t care. We texted for a few weeks and on one fateful unplanned night, we were only two bars from each other in uptown Dallas. I finally had my shot as she casually texted, “Come meet me at Trophy room.” This bar, Trophy room, known for it’s mechanical bull ride and college students, was probably not the ideal spot for a lifelong love affair, but I wasn’t about to miss my shot. I didn’t want to show up empty handed so I went straight to the bar to grab a few drinks. As I walked around to find her, with drinks in hand, I heard her voice call “Dexter?” for the first time from behind me. It was the sweetest, softest voice I’d ever heard. As I turned around my world of black and white quickly filled with color and I saw the most beautiful woman I’ve ever laid my eyes upon. We sat and talked as though we were the only two people in the bar. As if we were the only two people in the universe. It sounds fine to say now, but I let my brother know shortly after that night, I was going to marry that girl. Three months later, we adopted our baby pup Sadie-Mae, from the SPCA, 6 months in I tattooed her name on my chest, and after years of savings and working to gain her fathers blessing, I finally put a ring on it. There is no one I’d wish to give my time to more than Sydney. I can’t wait to drop some tears as you walk down the isle and say I do! I love you girl! What a dreamy day! Many congrats to the beautiful couple! 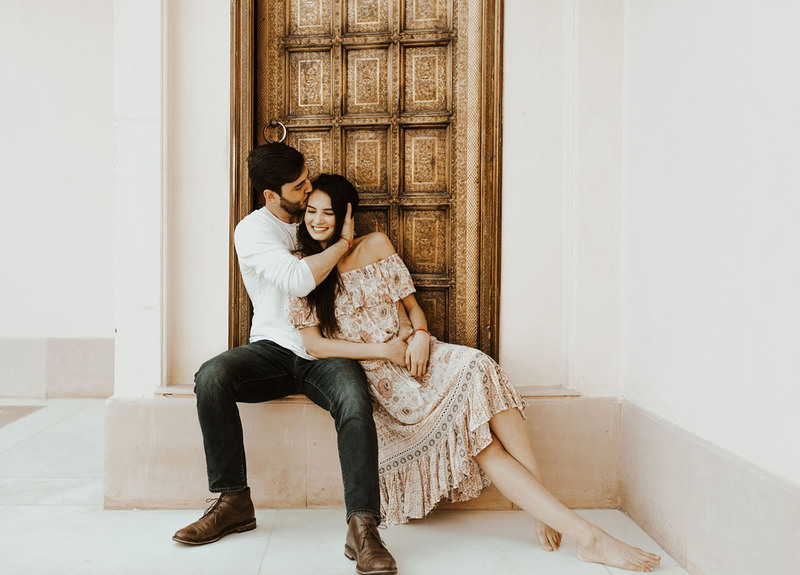 A 10-Mile Hike to Havasu Falls was Worth the Trek for these Engagement Photos! Looking forward to seeing wedding pics ! Very beautiful and romantic. I love this so much.